This progressive bingo linked system will be operated at Palace Station Hotel & Casino, Boulder Station Hotel & Casino, Texas Station Gambling Hall & Hotel, Sunset Station Hotel & Casino, Santa Fe Station Hotel & Casino, Red Rock Casino-Resort-Spa and Green Valley Ranch-Resort-Spa-Casino (hereinafter the “Properties”). The progressive bingo linked system permits live broadcasting of the Station Casinos Jumbo Bingo Progressive Game (“bingo game”) activity from an individual property’s bingo room to each of the other Properties’ bingo rooms. The system’s control terminal will be located at Red Rock. At the first (1st) bingo game of each session, on or about 9:00 a.m., 11:00 a.m., 1:00 p.m., 3:00 p.m., 5:00 p.m., 7:00 p.m., 9:00p.m., and 11:00 p.m. the control terminal will activate and link all the Properties’ bingo rooms for a live broadcast of the bingo game. Each day a different Property will “host” the bingo game. From time to time an individual Property may elect not to participate on a specific date or session in the bingo game. The dates and sessions of “non-participation” will be conspicuously posted in the respective Property’s bingo room at least forty-eight (48) hours prior to the scheduled bingo game. Once the bingo game starts if an even number is drawn it will be shown on camera but not called, and placed in the rack. The only numbers called will be the odd numbers. The bingo rooms will be linked by live broadcast (televised video and audio) and by telephone call conferencing. A bingo agent will be at a desk in each of the bingo rooms monitoring the live broadcast and telephone. In the event of a malfunction the agent at that Property will alert the other Properties by telephone of the malfunction. The bingo game’s caller will then transmit to the other Properties that there is a malfunction at one of the Properties and the bingo game will be paused for a few moments to correct the malfunction. If the Electronic malfunction cannot be resolved within a few moments the Players with the malfunctioning Electronic Unit will be disconnected from the bingo game and will be issued a full refund for all wagers on the bingo game or given a replacement Electronic Unit. The bingo game will then resume. If the problem hasn’t been resolved by then the Property that had the malfunction will be disconnected from the bingo game and its players will be issued a full refund for all wagers on the Jumbo Progressive game. The bingo game will resume at the other Properties. The bingo game coverall number, prize amount and consolation prize amounts will be posted at each Property. The bingo game winner will be paid on the balls drawn only, not by the numbers on the display boards. The display boards are for the convenience of the players and are not the official game results. Regular Jumbo cards (3-on) will sell for $2 and the consolation will be $500, Unless the posted jackpot amount is greater than or equal to $130,000 and the maximum number of called balls is 53 – in that case the consolation is $1,000. If the Jumbo Progressive Jackpot is won player(s) cannot collect the Consolation for that session. The Maximum of 50 Jumbo Bingo cards may be purchased in a session. In the event there is a winner in the designated amount of numbers the bingo game will be stopped and an Independent Supervisor will be called or verification. Only cards sold at the current session are eligible. Cards sold at previous sessions will be declared void and will not be considered a winning card. The winning card(s) will be displayed in all bingo rooms via the live broadcast and verbally announced throughout all bingo rooms by the Independent Supervisor who will verify the bingo game results. The Jumbo Progressive Jackpot is aggregate among all participating Properties and in the event of multiple winners the Jumbo Progressive Jackpot will be split evenly between all winners. In the event there is not a Jumbo Progressive Jackpot winner in the designated amount of numbers, additional numbers will be drawn for the consolation prize. The consolation prize winner(s)will be verified by displaying the winning card(s) in all bingo rooms via the live broadcast. When there are multiple winners the Consolation prize(s) will be split, based on number of winners, and payout on type of card played. After the verification of a bingo game prize winner or consolation prize winner the Properties will be “unlinked” and the Properties will begin their standard sessions. The Jackpot Reset value is $100,000. Management may change the rate of progression at its discretion; however, the rate will never be below .4 of one percent of the total amounts wagered on the bingo game. The bingo game’s posted progressive amount will not be reduced unless it is won by a player or to correct a malfunction. The bingo games coverall upon initial rollout will start at $100,000 and 47 or fewer called numbers. The number of balls needed to win the Jackpot is dependent upon the posted jackpot amount. 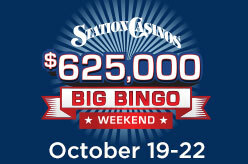 When the Jumbo Bingo Jackpot hits, the remainder of the session will become a Bonus Session. • When the Jackpot is won- the winner receives the posted value in cash. The Jackpot amount is aggregate, If there are multiple winners, the prize will be distributed equally based on the number of winning cards a player has. • At all participating properties, all regular games will pay $1000 for any color card. 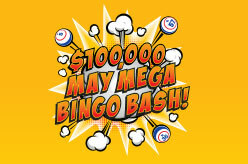 • Players must have purchased at least one Jumbo Bingo Card to be eligible for the Bonus Payout of $1000 • Big 3 Game is not eligible for $1000 Bonus Payout • Only 1st Chance Coveralls are eligible for $1000 Bonus Payout • Progressive Coverall payouts rules will take precedent over Bonus Session rules, in the event a player wins the 1st Chance on Progressive Coverall card. In order to win the Jumbo Progressive Jackpot amount, you must declare your win within the required posted jackpot number or less. NO late winners will be honored. All sales will be final for the Jumbo Progressive game once the game has started. Employees of Bingo King, Arrow International, Fortunet, Game Tech and their affiliated companies are not eligible to participate in the bingo game. Management reserves the right to exclude any individual from this promotion at any time in its sole discretion. The Cash ball will be drawn and announcement to the room, and then put back into play prior to the start of Game 1. Your paper pack must be validated and the electronic receipt must have “validated” printed on it. You must bingo on the Cash Ball number on a validated pack. The Cash Ball number must be the last number called. The Cash Ball is only in effect on games games 2 through 5 and 7 through 13, it is not valid on 2nd or 3rd chance coveralls, Big 3’s, Dual Action, $1 Progressive Coverall, or any special progressive games or special sessions. Players are playing for the Cash Ball jackpot amount posted at the session they are playing. Once the Cash Ball is won at a session, it is no longer valid at that session. It will reset for the next day’s session. If there is no winner on the Cash Ball at a session, the jackpot amount carries over to the next day at that session. All Cash Balls are aggregate payouts. The Cash Ball will be drawn after the Jumbo is finished, announced to the room, and put back into play prior to the start of Game #2. This will also be the Secondary Cash Ball. The Secondary Cash Ball will go in effect once the primary cash ball has hit. The Secondary Cash Ball is in effect on Games 3 through 13 on all regular sessions and Games 3 through 19 on the Colossal session. Secondary Cash Ball is not valid on second and third chance coveralls, Big 3s, Dual Action, or $1 Progressive Coveralls. All paper and electronic packs must be validated and electronic receipt must have “validated” printed on it. Guests must have paid $2 extra for Validation for Secondary Cash Ball. The session’s primary Cash Ball must have hit for that session. The Secondary Cash Ball number must be the last number called. Players are playing for the Secondary Cash Ball jackpot amount posted at the session they are playing. Once the Primary and Secondary Cash Balls are won at a session, they are no longer valid at that session. The Secondary Cash Ball will reset to $500 for the next session. The regular session Cash Ball resets at its normal amount for that session. If there are no winners on the Secondary Cash Ball at a session, the jackpot amount will be determined by the amount of sales and carry over to the next session. All Cash Balls are aggregate payouts. All Cash Ball rules will apply. Standard Bingo rules will apply except where changes are noted above. This offer requires extra $2 validation for the Secondary Cash Ball to be eligible to win. Management reserves all rights to cancel or change this promotion at any time. Winning ticket must be purchased at session played or it will not be paid. The progressive resets at $1,000. The progressive increases $100 per day until hit. You must be playing the regular session in order to be an eligible winner. In order to be a winner you must catch 3 out of the first 4 numbers drawn during game 3. If there is no winner after the first 4 numbers called the game is finished as there is no consolation prize. Big 3 Bingo will be played at every session of bingo. Progressive Coverall cards begin to play alongside game 11. Cards will pay as a Level 1 during Games 11 and 12. Players must have a current valid cashier receipt to be eligible to win any jackpot prize. Winners must surrender their receipt to claim their prize. The jackpot amount starts at $15,000 and progresses daily prior to the 9am session. Players will be playing for the posted jackpot amount and that amount must match the Bingo Records. When the jackpot is won during a session the reserve jackpot of $15,000 will become the main jackpot for the next session. The last number called is required to win the progressive amount. In the event that there is a higher posted first chance coverall than the above payouts, the higher amount will be paid. $15,000 Progressive coverall packs are available at each selling window for $1 or $2. $2 packs are validated for the Cashball. A maximum of Sixty $15,000 Progressive Coverall packs are available in the electronics. A player must be present in the bingo room and have a minimum buy-in for the session to be eligible to play the $15,000 Progressive Coverall. Payouts are aggregate when there is more than one winner on the $15,000 Progress Coverall cards. In the event of a split winner on the Coverall involving a $15,000 Progressive Coverall Card and a regular pack, the $15k Progressive Coverall will pay full and the regular pack will be spilt according to the number of winners. All House rules are applicable to this game. Management reserves the right to change, cancel or modify the terms of this promotion at any time. By participating in this promotion, participants agree to be bound by these Official Rules and the decisions of Management. Management will resolve any dispute or situation not covered by these rules and that decision shall be final and binding on all participants.